Sometimes we all get behind on paying bills and meeting financial obligations. While this can be exhausting and overwhelming enough in itself, it becomes even worse when creditors opt to start garnishing wages. When someone chooses to garnish wages, it means that they are withdrawing money directly from your paycheck, making it impossible for you to budget around your planned income or keep up with other important bills. Not only does it cause a financial strain when wages are garnished, but many employees find themselves faced with humiliation since their employer must know about their situation. Some employees even lose their jobs because of the extensive paperwork that employers do not want to fill out. If you’re dealing with the possibility of wage garnishment, then it’s time to learn more about how to avoid it! When you are no longer able to keep up with your bills, your creditors can go to the courts and get a money judgement against you. When this happens, creditors are given the legal green light to move forward with the garnishment process. Before garnishment happens, Ohio law requires that the court provide you with other payment options – to avoid garnishment, you must reply to their notice with either money or proof that you are exempt from payment based on your total pay check. If you don’t reply to the notice, garnishment can begin, and you will be forced to lose part of your paycheck until the bill is covered or something changes. Garnishment generally involves 25% of your take-home paycheck. If you are behind on income taxes, student loans, or count-ordered child support, your wages may be garnished without a court judgment. 1. Make Payments Before Garnishment Happens. Your first option is to return the form that you receive from the courts within 15 days and then make consistent payments until your debt is paid. 2. Set up a Trustee. Have a court-assigned trustee in charge of your debts. Rather than pay the creditor, you will give your money to the trustee who will then send it to them. This prevents your employer from getting involved in garnishment, although you will still have to pay the trustee each time you are paid. 3. Pursue Bankruptcy. While bankruptcy comes with some disadvantages, it also gives you the opportunity to start over fresh without large debts looming over you. If you are facing wage garnishment, don’t let yourself feel defeated or hopeless. There are still options available and ways to avoid having your paychecks cut back. 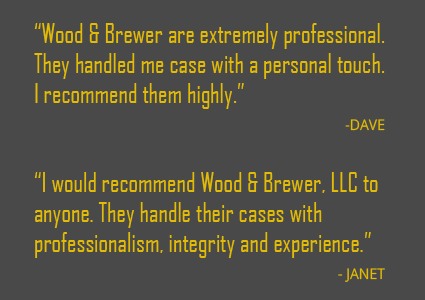 Consider contacting the team of Wood & Brewer LLC, a bankruptcy attorney team serving Westerville and Columbus, Ohio to discuss more options and discover which plan is best for you.